Now On Sale at Kickstarter! It's not often I ever do an update on an update before a contestant even appears on the Shark Tank, in fact, I believe this is a first. Half the fun about writing this Blog is learning about new products and services along with the Entrepreneurs that have created them before they appear on TV. Unlike the Sharks that know nothing about the business before they walk into the Shark Tank, I have already done my homework and usually know quite a lot about the business and/or product. I also have the advantage seeing how the entrepreneurs react when they get that final call saying "You made the final cut and scheduled to be on the Shark Tank Show" which is never a guarantee even if you did go in front of the Sharks. I have seen a few businesses get fantastic deals already knowing they will never get completed after the Sharks dig a little deeper. I have also seen some really cool inventions that knew the Sharks would invest in, but to my amazement, they passed on investing in the business. Usually the most common reasons the Sharks pass on a cool new product or service is overvaluing the business, undervaluing hoping to start a bidding war, not knowing your numbers, margins too low to make a decent profit, other Angel Investors already have large equity stake or simply the technology/market is not mature enough at the present time. So what's this all have to do with the Kymera Body Boards? After reading what I just wrote, that's a good question. Jason Woods the inventor of the Kymera Electric Bodyboards will be on the Shark Tank Show tonight featuring what I think is a really cool invention that could become very successful in a short amount of time. 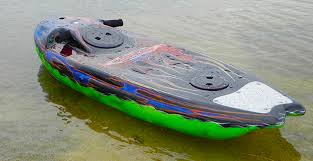 If you read the Kymera Body Board Article on Shark Success Blog written over a week ago, I was 99% sure the Sharks would invest in this Jet Powered Body Board, now I'm not so sure. The good news if you don't make a deal with the Sharks is you still control 100% equity in your business and still get all the priceless publicity that comes with appearing on the Shark Tank Show. Sometimes the business is not a good fit for any of the Sharks, but there are thousands of other Sharks watching the Show that will gladly invest in businesses seen on the Shark Tank. One of the best ways (If not "The Best") to raise capital for a new product that didn't successfully get a deal is to start a Crowd Funding Campaign to co-inside with your appearance on the Show. Several past contestants have successfully raised several thousands of dollars using the crowdfunding method after their appearance, but never to the extent Jason Woods is about to undertake with the Largest Goal for any Shark Tank product to date. The way Jason has the rewards set up should make for a very interesting and exciting campaign to keep an eye on and see if he can raise the $175,000.00 needed to kick start the Kymera Body Boards into full production. As with most crowdfunding projects, there are the standard smaller pledges available to show your support. But when the pledges get down to actually pre-ordering one of the first Kymera Boards it had me doing a double take as they all looked the same only with higher financial commitments. After realizing how this campaign is set up I must say I am impressed and think this idea just might actually work to raise over $175,000.00 within a month's time. I was fortunate enough to get on Kymera's website before it is now re-directing to the biggest crowdfunding campaign by a Shark Tank Contestant. As reported in the first article the Kymera Electric Bodyboards cost $3200.00 for the complete basic package. You can now buy the exact same Electric Boogie Board at Kickstarter for only $1995.00 which is a no brainer if you were already considering buying one. Heck for that price you might as well buy two Jet Powered Electric Body Boards, but you better act fast because the prices are going up I would imagine very fast. According to the Kickstarter campaign there's only 25 Bodyboards available at this price before they are sold out and quickly get this campaign past the $50k level. The next 50 Kymera Body boards will then be available for $2250.00 which is still a great deal from the original retail price. This will also bring the campaign up another $112,500.00 for a total of $162,500.00 of the $175k Goal from only 75 commitments. The price for the next 100 Boards goes up to $2500.00 and is the cutoff for guaranteeing you will receive one of the first Jet Powered Body Boards available to the public. With only 175 Kymera Bodyboards guaranteed in the first production, I would imagine they won't last long before your forced to stand in line for the second production also available for $2500. Just the first 175 alone will more than double the $175,000.00 Goal that needs to be completed before Jason Woods can start building his version of a Boogie Board. Something tells me that's not going to be a problem. This should be a very interesting funding project to keep an eye on as the Shark Tank Effect takes hold and turns this Dream into Reality!. Man, shark tank success doesn't miss a beat! Thanks again for your support! As you know I can't give any insight as to how things will play out tonight but I will say that Kickstarter was always part of the plan regardless if we got a deal or not. Why? We are likely to have a lot of interest tonight but no ready inventory to sell we decided it would be best to use kickstarter to give everyone realistic delivery dates and the means to keep them up to date with progress. After seeing the bad press from successful shark tank items like the SBU who fell behind on delivery we wanted to make sure we do our best to keep everyone involved. Thanks again! Should be exciting to see what happens next! That's really a good news. Might think about getting on Twitter as well as other social networks. Don't discount the power of a simple twitter page and following. With just 23 backers and just $19,000 of your $175,000 goal...you're not guaranteed getting this funded and it's apparently not your first shot at this. It seems like you'd have been better off giving up some additional equity and looking for a strategic partner to help you market this and actually get your patent work done, and legal items in line to help you move this to those "wealthy" folks who want one or two of these on their boats or get them in sets of 3 or 4 to reduce the price a little bit. Anyway, good luck with what you're trying to do, but after 10 years at it...you should probably look at licensing this out to someone else and taking a royalty on this and walking away from it. I just saw this presented on Shark Tank. I can not believe they turned it down. This is a great idea. Regular body boards are useless when there are no waves and useless on lakes and such. I would be interested in investing!